Signed and dated in the respective quire of the parent manuscript by the scribe Jacob van Enckhuysen on 21 December 1474. Miniatures: Tempera, ink, and gold on vellum. Leaf: 534 x 355 mm. Leaf from the Psalterium triplex of the Zwolle Bible, opening Psalm 101. Written by Jacobus van Enckhuysen in the Zwolle House of the Brothers of Common Life; possibly illuminated by Petrus Bree or Hermannus of Coevorden. Each of the three large initials D shows a scene from the life of King David. In the first, David plays the harp as the Ark of the Covenant is brought back to Jerusalem (possibly shown as the silhouette of medieval Utrecht) on an ox-cart. In the second, David kneels in prayer before an altar with the Ark. In the third, David, on his deathbed, hands his crown to the young Solomon at Bathsheba's request. This leaf comes from one of the best-documented commissions in the history of Dutch manuscripts. In 1462, Herman Droem (d. 1476), dean of the chapter of St. Mary at Utrecht, ordered a large six-volume bible to be made for use in the choir or the library of St. Mary's. 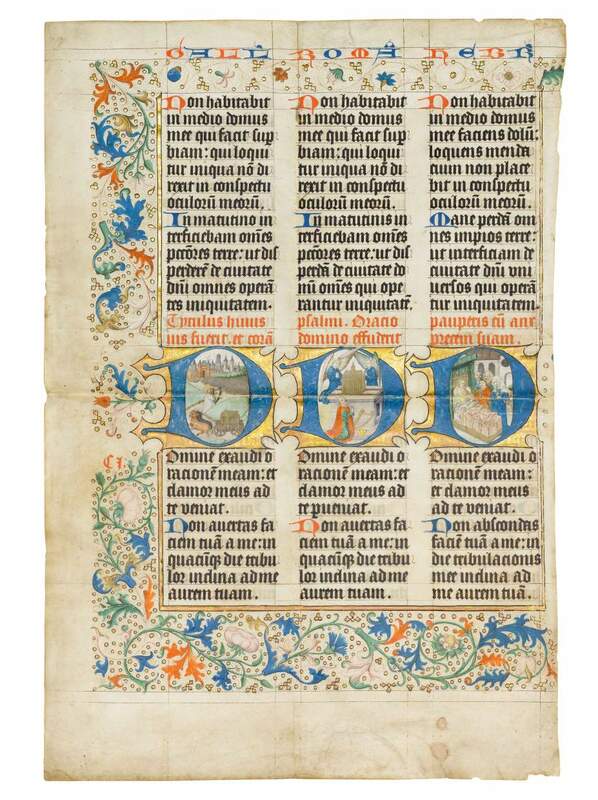 It was produced in the House of the Brethren of the Common Life at Zwolle and finally completed on 20 March 1476. The Chronicle of the Zwolle Fraterhouse names the scribe, illuminators in the house, and the costs of the books. All six volumes, each c. 600 leaves, were copied by the librarius of the community, Jacobus van Enckhuysen (d. 1483). As Jacob signed and dated each quire, he offers us a fascinating insight into the years of work he spent on this magnum opus. All volumes (Utrecht, Universiteitsbibliotheek, Hs. 31) lost leaves when the books were exhibited at St. Mary's from 1570 to 1740; five cuttings have turned up since.